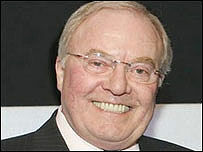 Well-known broadcaster Mike Neville has announced he is stepping down. The 69-year-old is leaving North East Tonight, Tyne Tees Television's news show, which he has hosted since 1996. He has been away from viewers' screens as a daily news presenter since July last year, when he had emergency surgery to remove a blood clot. He has been involved in broadcasting news in the north-east of England for more than four decades on both Tyne Tees and the BBC. Tyne Tees managing director Graeme Thompson said: "It's the end of an era for television in the North East. "We've all grown up with Mike and we are going to miss his unique presence. We're delighted his health continues to improve." Mr Neville first appeared on screen in February 1962 when he joined Tyne Tees. He then moved to the BBC where he presented Look North and Nationwide before moving back to ITV 10 years ago. He said: "I've been thrilled at the number of letters and cards I've received from viewers over the past months whilst I've been recuperating. "I am going to miss being invited into homes every evening at six o' clock."